The one-day trip on Friday, 3 August, 2018, was also joined by national experts on shipbuilding quality standards and officials from the Tourism Authority of Thailand (TAT). This is to re-build tourism to assure confidence among tourists that the necessary measures are moving forward. The Chinese media inspected Chalong Pier, its dock and its procedures before allowing vessels to leave for sea tours and diving. In the latest attempt to uplift Phuket’s tour boat safety, there have been improvements of Thai tour boat rules and regulations. 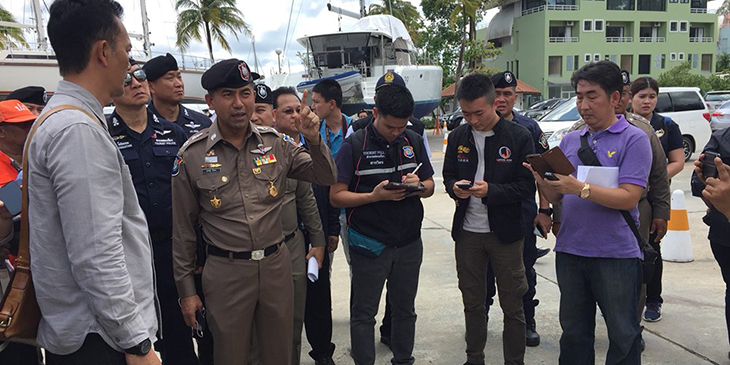 The captain and helmsman must register each boat’s name and specification, plus the exact number of passengers and tour route must be submitted to the responsible officials including Phuket’s Marine Office, Tourist Police and Provincial Administrator before leaving port each time. Thai boat operators will be swiftly punished with the maximum penalty that the law affords if found in violation of the new laws related to marine tourism. This is effective immediately. In addition, the Chinese delegation inspected vessel and shipbuilding quality standards that a blueprint of every boat must be inspected by officials and must be officially authorised. In case of any incident, the officer who authorised the boat will also face charges if the vessel in question is found not to be up to standard.